A number of blogs spoke highly of this book so I decided to pick it up and read it as well. Russell Moore teaches at the Southern Baptist Theological Seminary in Louisville, KY. I have read some of Russell Moore before and have not seen eye to eye with all of his theology, particularly his eschatology. While that difference does appear throughout the book, I did find that the book made some excellent points regarding dealing with temptation. 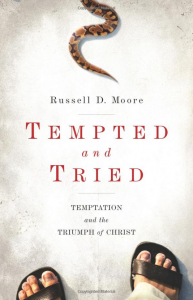 Moore’s main point is that temptation attacks our identity, desires, and future and that we need to realize that the devil will twist these things away from their true fulfillment in Christ. This is a needed point to be made. I find Moore’s discussion generally helpful. I was quite disappointed with his discussion of legalism toward the end of his book. Moore’s discussion of this issue was too short and ended up equating legalism with “rigid religious school” rule-making (which he caricatures).